In partnership with architectural firm Sasaki, OSRAM focused on reinforcing its core motto, “Light is OSRAM,” in the new workspace. With an emphasis on light as a building material, the new 130,000-square-foot location harnesses the power of natural light, and implements smart technology to lower energy consumption and ultimately costs. 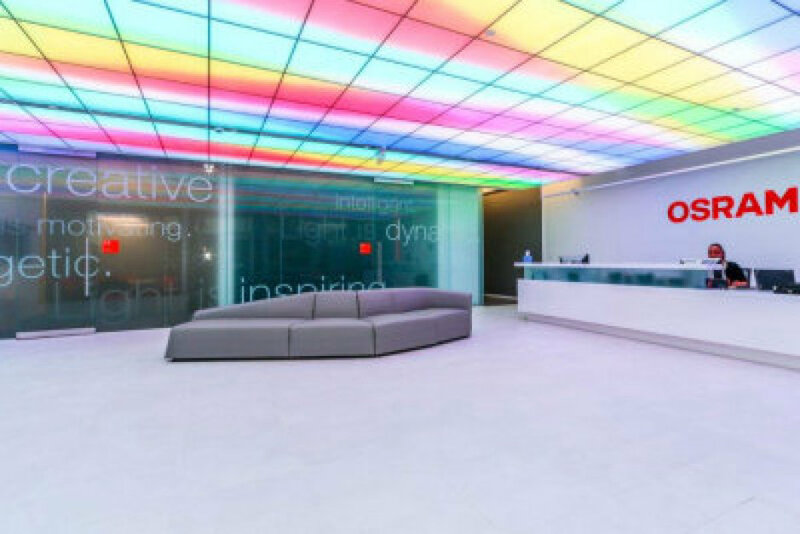 By consolidating two of the company’s three facilities in Massachusetts, the headquarters effectively reduced OSRAM’s carbon footprint and increased building sustainability, while also achieving LEED Gold Certification through the use of LED sources and daylight dimming. OSRAM’s Americas headquarters houses 230 employees in various corporate functions, as well as OSRAM’s Digital Lighting Solutions, Sylvania Lighting Solutions, and research and development activities. The regional headquarters also has been awarded CoreNet Global’s Best Large Renovation (larger than 80,000 square feet), and the International Facilities Management Association’s Achievement Award for Best Practices for large projects. The International Interior Design Association (IIDA) is the Commercial Interior Design Association with global reach. It supports design professionals, industry affiliates, educators, students, firms and their clients through a network of 15,000+ members across 58 countries. IIDA advocates for advancements in education, design excellence, legislation, leadership, accreditation and community outreach to increase the value and understanding of interior design as a profession that enhances business value and positively impacts the health and well-being of people’s lives every day.